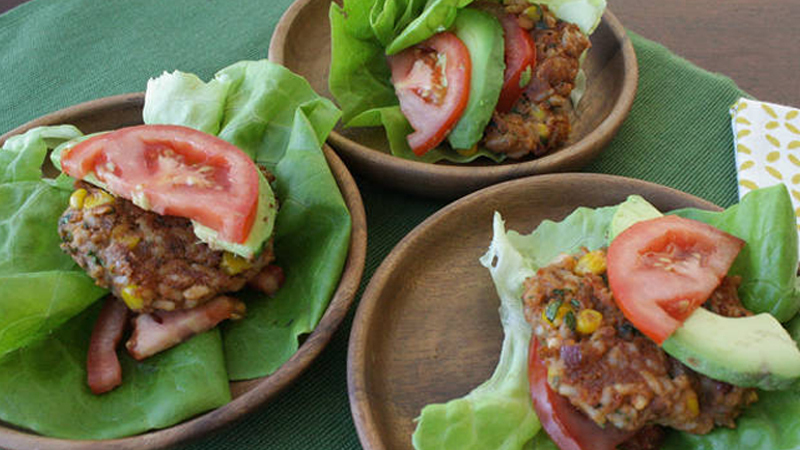 Try this new twist on veggie burgers; the refried beans make the burgers incredibly easy to make! 1. Mix the beans, sweetcorn, rice, bread crumbs, onion, coriander and taco seasoning mix in a medium bowl. Shape the mixture into 12 patties, then place onto a greaseproof paper lined baking sheet and refrigerate at least 20 minutes (for easier handling refrigerate up to 2 hours). 2. Heat a large frying pan over a medium heat. Add 1 tablespoon of the vegetable oil and cook half of the patties in oil for 3 minutes on each side, until a brown crust forms. Repeat with the remaining oil and patties. 3. Serve on the lettuce leaves with tomatoes and avocado. • These burgers are delicious with a drizzle of hot sauce. • These are also delicious on burger buns!